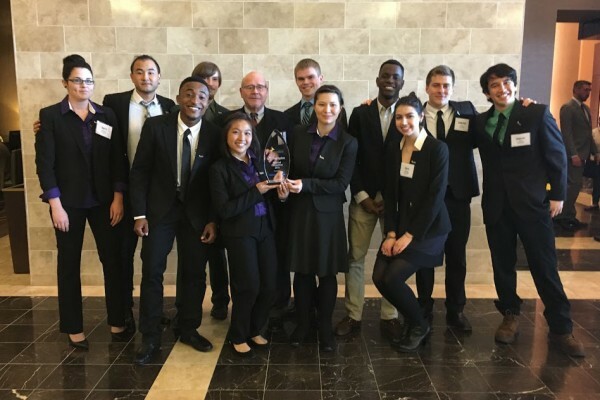 Cornell College’s Enactus team won the regional championship at the Chicago Enactus Competition March 21. Cornell’s Enactus team, left to right: April Richards, Hwi Ram Jeong, Abubakar Shehu, Nigel Ticknor, Anh Pham, Enactus advisor Tom Simon, Ryan Anderson, Robin Bridgman, Husani Newbold, Zara Anderson, Gabe Flippo, and Salem Osaki. Enactus is a global organization with more than 1,700 college and university teams focused on entrepreneurial action. At the Chicago regional competition, 35 Enactus teams competed for qualification to the national competition in St. Louis in May. The competing teams presented their entrepreneurial projects to more than 100 judges comprised of professionals, recruiters, and executives from the region. Teams competed for qualification to the U.S. National Expo in St. Louis in May, where more than 140 Enactus teams from Hawaii to Maine will converge to compete and network. The Cornell College Enactus team beat out many larger schools to capture their trophy.